One of the topics we explore in depth in our Advanced Barista Skills class at the Five Senses Barista Academy is brew water temperature and its effect on espresso taste and extraction. Brew temp is an easily accessible brew parameter with the right espresso machine, but is not something that all café operations chose to alter as part of their morning dial in. Conversely there are plenty of cafes using brew temperature for everything from regulating extraction yield, to overcoming issues with machine and grinder temperature as their workload increases. To bridge the gap and provide some info for new and experienced baristas alike, I?ve prepared some objective testing and solid numbers to digest. It has been observed using a standardised recipe and solid brewing technique that brewing hotter will result in higher extraction yields (more content removed over time) while brewing colder will extract content at a slower rate (less content removed over time). Taste wise, hotter temps result in increased body and sweetness (with a greater chance of astringency and bitterness), while cooler temps emphasise less bitterness, body and sweetness (resulting in a sour, bright shot). Lowering the brew temp will enhance acidity in coffee/raising the brew temp will decrease acidity in coffee. As the grinder heats up, the ground espresso coffee tend to become more soluble, and extraction yields can increase. Lowering the brew temp is a way to counter this. Increasing the temperature can be used to increase the extraction yield of a slow, dripping shot. Higher temps can be used to compensate for an underdeveloped roast while lower temps can be used to overcome the high solubility of an overdeveloped roast. These suggestions guide practice in many commercial cafes. There is probably a mixture of truth and half-truth among them, and maybe even some outright heresy, but it would certainly be nice to have more data to back it up. If you stay tuned for a follow up article you’ll get exactly that — I’ll be using some nifty equipment to test the effects of puck depth, density, and brew temp. For today?s article I wanted to answer a simpler question — what does brew temperature do to extraction yield and flavour? If you need a quick catch-up on extraction yield and what it is, check out my previous article on VST baskets here. 40 × 22g espresso shots were ground en masse and allowed to cool to room temp. The espresso shots were prepared using a standardised recipe: 22g dose, 46-48g beverage, ~29 seconds shot time. The preparation method used was a stockfleth distribution followed by a single collapse on the bench and a super firm tamp. A single grouphead and handle were used. Ten shots were poured at each brew temperature (92, 94, 96 & 98 °C) Espresso was prepared in groups of 10 ? first at 92, then 94, 96 and 98. Shot time and beverage weight were recorded for each extraction. A sample of each coffee was immediately removed and sealed (in a pipette) to prevent sample evaporation. Each sample was filtered and TDS readings were taken. Extraction yield was calculated and recorded. Samples were set aside for tasting. To remove the outliers, I sorted each temperature category by extraction yield and removed the two highest and lowest data points. This reduced the sample size, but removed outliers resulting from inconsistent extraction behaviour. 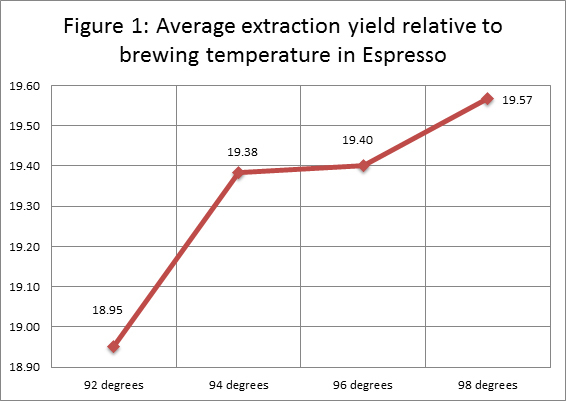 Tables 1-4 summarise the data for each extraction temperature, and Figure 1 puts it all together for you. You can see from these results, a nice consistent trend! Lower brew temperatures produced a lower extraction yield, whereas higher brew temperatures produced a higher extraction yield. With a much larger sample size, we might expect to see a smoother line. What’s most surprising from this data is the relatively small difference in extraction yield a 6°C temperature change makes! The total difference was just over half a percent yield from 92 to 98. Even more interesting is just how radically different the cups tasted, despite the relatively small difference in extraction yield. the lowest temp cups had lower body, sweetness and bitterness but higher acidity. the highest temp cups had lots of body, sweetness, bitterness, medium acid? and a strange powdery mouthfeel . the two mid temps were balanced, with high levels of sweetness, balanced acid, low bitterness and good body. Does this mean our tasters were detecting the tiniest differences in extraction yield, or is it something to do with the balance of constituents removed from the coffee? Maybe both? I’m going to go with maybe both, and if you read on you’ll see why. The perceived flavour changes which result from altered brew temperature are in agreement with data from ?The Coffee Brewing Handbook? (Ted Lingle, SCAA). Rather than reprinting the whole section on temperature changes from the handbook (I?d love to), Figure 2 is a quick graph I made from data in the book showing how the flavour components of the brew change as the extraction temperature changes (74, 94 and 100 °C). The amount of citric acid extracted falls as the temperature increases from 94 to 100°C. The amount of malic acid in the cup is lowest at 94°C. Extraction is optimised at 94°C (sucrose/sugar extraction is at its peak), with a large increase up from 74°C. 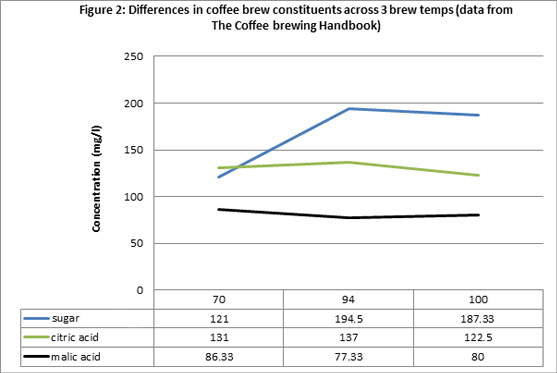 Even with this snippet of data, you can see the huge effect brew temperature has on constituent balance*. If this isn’t a great explanation for the taste differences in our cups, then the other route to explore the huge effect on taste which we get from very small differences in extraction yield. If you put it together, this data clearly demonstrates two things — higher brewing temps lead to higher extraction yields, increased sweetness, bitterness and body while slightly reducing acidity. Lower temps result in lower extraction yields; have less body, sweetness and bitterness and more pronounced acidity. Although the yield differences are small, the cupping results are huge, leading me to the conclusion that there’s a little more at play in terms of what temperature does to our cup profile than to simply increase or reduce overall extraction yield — the changes to the extraction of each flavour component are larger than the overall change in extraction. This round of testing wasn’t thorough enough to answer some of the most burning questions on the topic of brew temp. One thing that stands out is the limited information gained from the use of a single espresso recipe and its resulting flow rate — would a faster flow rate provide a wider range of extraction yields? This is something I’m very keen to explore. Stay tuned for an upcoming article in which we further explore the effects of temperature across a range of grind profiles, as well as the effect your espresso flow rate has on your ability to thoroughly extract coffee (and how temp can help in that regard). *the testing from Lingle’s book was conducted with large volumes of filter coffee, not espresso. Still, I believe the effects observed in my testing on espresso are due to a similar effect of creating a different balance of constituents depending on the brewing temperature. Ted Lingle. The Coffee Brewing Handbook (Specialty Coffee Association Of America Handbook Series, Second Edition). SCAA, 1996.